China has intensified its drills in the region amid growing tensions over Taiwan after the US president signed the National Defense Authorization Act that lays the grounds for future mutual naval visits between Taipei and Washington. 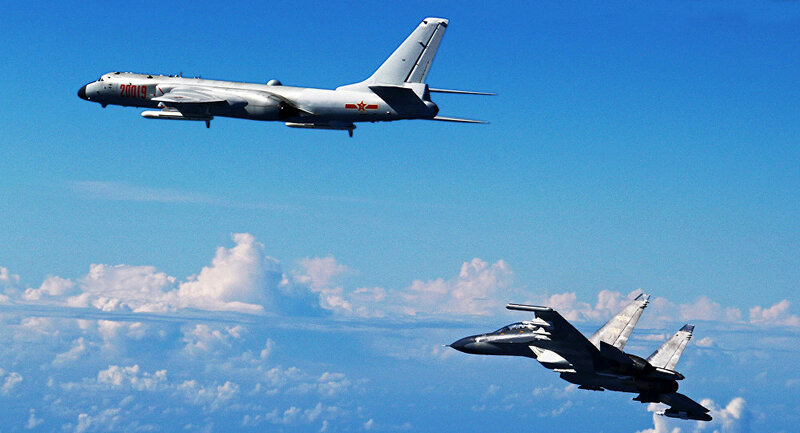 China's air force has conducted long-range drills near Taiwan and in the Sea of Japan, following last week's "island encirclement patrols," Reuters reported. Fighter and bomber aircraft flew through the Tsushima Strait between South Korea and Japan into the international waters of the Sea of Japan, Chinese Air Force spokesman Shen Jinke said, emphasizing that the drills were routine and lawful. However, the drills prompted a reaction from South Korea, with fighter jets being scrambled in response. According to a statement issued by South Korea's Joint Chiefs of Staff, five Chinese military aircraft flew through the Korean and Japanese Air Defense Identification Zones. "Our fighter planes took normal tactical measures, identifying the models of the Chinese planes and flying aerial surveillance until they left," the South Korean statement said. A Chinese air force spokesman, in his turn, said that despite South Korea's move, the drills achieved the aims. At the same time, Beijing held another drill, with China's aircraft flying through the Bashi Channel that separates Taiwan from the Philippines and then returning back through the Strait of Miyako between Taiwan and Japan, the Taiwanese military said, adding that it saw Japan sending an F-15 in response. However, the Japanese authorities haven't issued any statement yet. The drills follow last week's long-haul flight through the Bashi Channel and Miyako waterway by a Chinese mainland Yun-8 transport plane, with Taiwan sending aircraft and ships to monitor the situation. China has intensified its drills in the region amid growing tensions over Taiwan, as Beijing has accused Washington of meddling in its internal affairs after President Donald Trump signed the National Defense Authorization Act into law last week. The act lays the ground for future mutual naval drills between Taiwan and the United States, though, officially, the US doesn't recognize Taiwan as a separate country, with Donald Trump saying that Washington sticks to the "One China" policy. While the People's Republic of China and Taiwan, officially known as the Republic of China, formally remain a single country as each considers the other as "renegade provinces," Beijing has repeatedly called it "the most sensitive issue" in its relationships with the United States. The mainland China authorities think that the president of Taiwan and head of the Democratic Progressive Party, Tsai Ing-wen, may call for a referendum on the island's formal independence next year.